As Easter approaches, I remember a wonderful treat from my childhood. When I was about 10 years old, my family lived in an apartment in the midst of a big Italian family. The grandparents, known to all as “Ma and Pa”, lived in the “Big House” which was surrounded by the smaller homes of their many children and their families. Two unmarried daughters as well as the family of one of their brothers also lived in the Big House. It was clear that the Big House served as the social and communications center for the whole family. Evening meals were a gathering of the famíglia, with the women serving the meal to the men who ate at a long wooden table in the kitchen. Then the children took their turn, and finally the women ate and cleaned up. 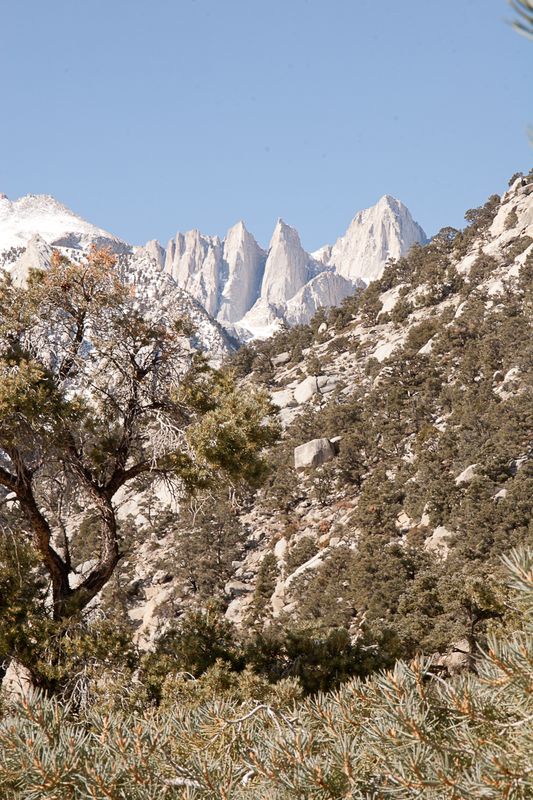 This family tradition carried over into many other activities, especially near the holidays. In the spring, before Easter, there was a great deal of cooking and baking in preparation for the celebration ahead. 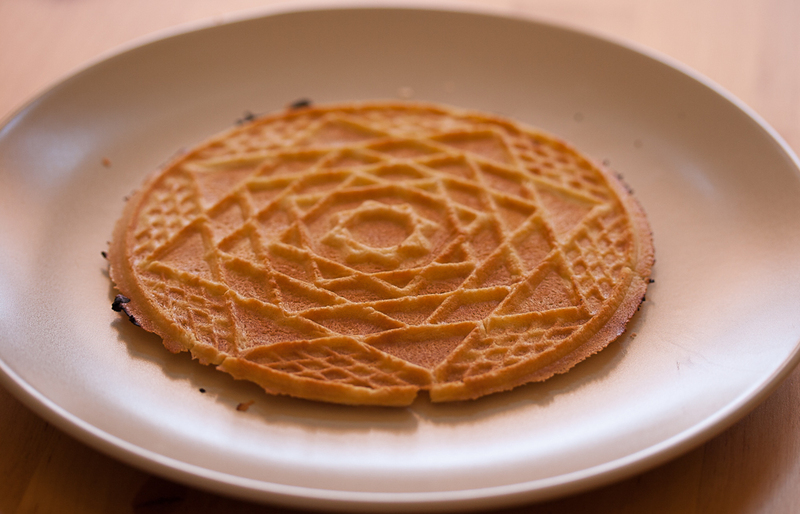 A favorite during this baking spree was the pizzelle. These delicate cookies were baked outside over a hot stove. Kids clustered around to get them still warm from the griddle. That’s still the best way to eat them. You can spread them with butter or jam while they are still warm, and they are so good. 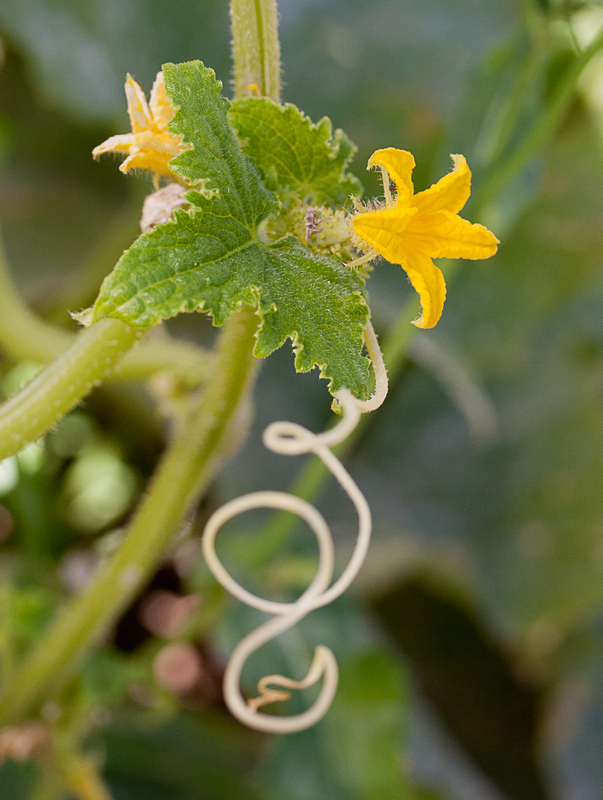 You can also form them around a conical wooden dowel (like the plunger in a chinois) while they are still soft and warm. As they cool, they will firm up and make a perfect cone for your gelato or ice cream. 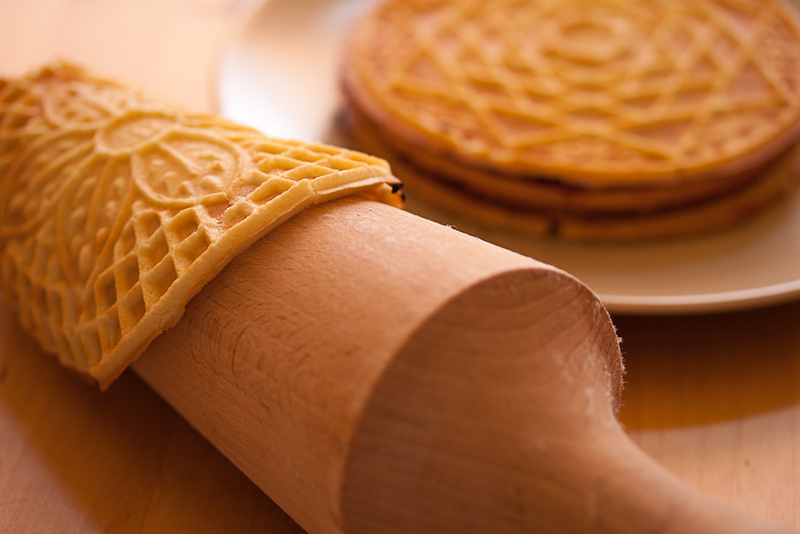 You will need a special pizzelle baking iron, but you can find one in most specialty cooking stores or websites. 1. In a small bowl, combine the flour, baking powder, and lemon zest and set aside. 2. In a medium bowl, beat the eggs and sugar together with an electric mixer until pale yellow and smooth. Add the melted butter, vanilla, and anise extract and beat until completely combined. 3. Gradually stir in the flour, baking powder, and lemon zest mixture to form a smooth batter. 4. 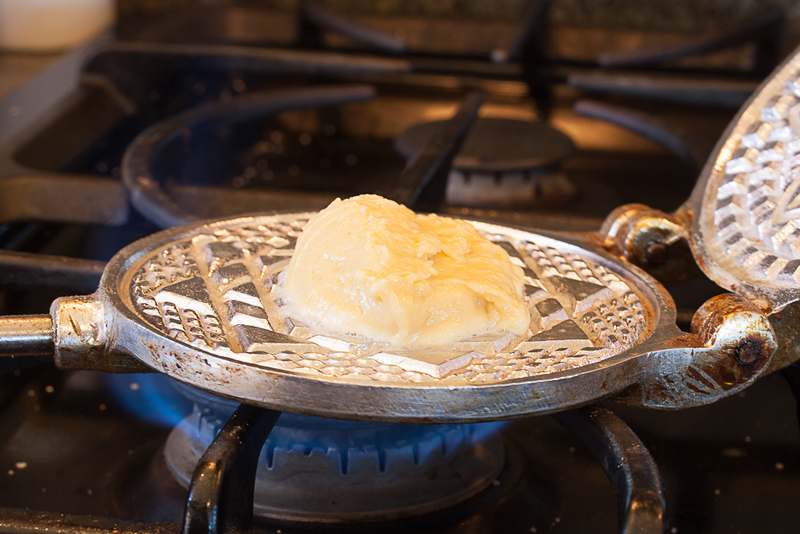 Heat the pizzelle iron on both sides until very hot. Brush both sides of the mold lightly with butter, spoon in about 1 tablespoon of batter, and close the iron. 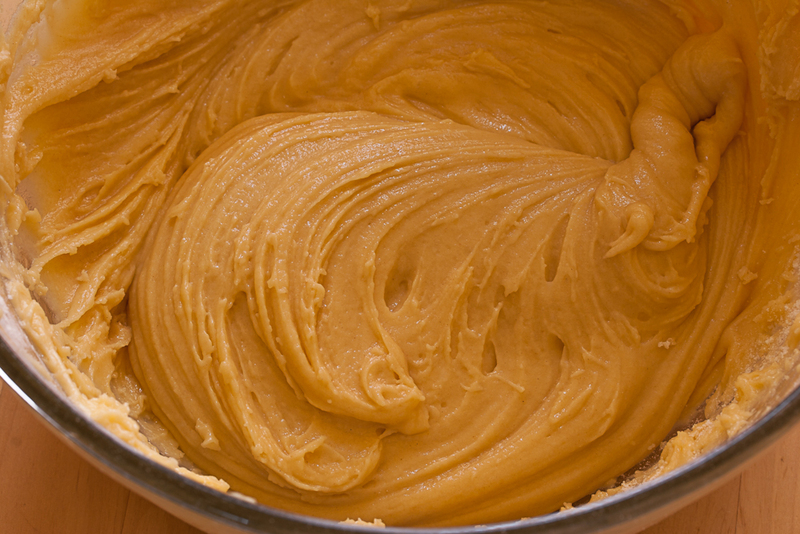 Trim off any batter that oozes out of the iron. 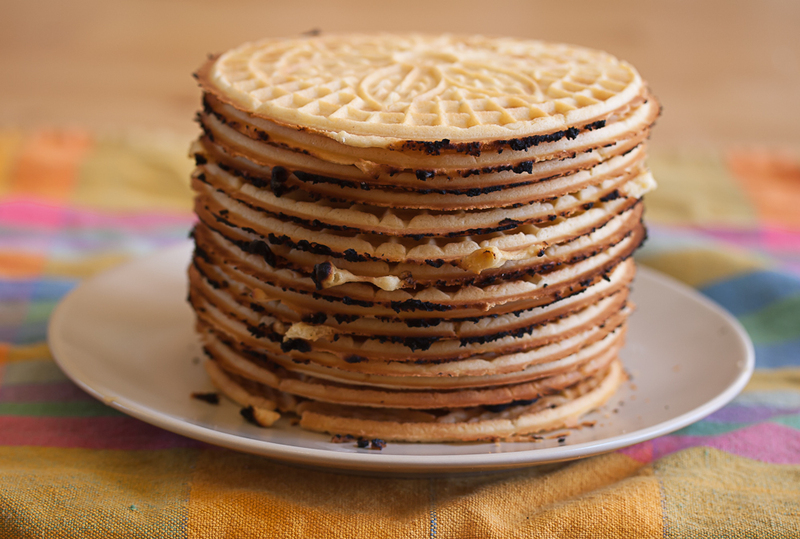 Bake about 1 minute on each side or until the pizzelle is golden brown. 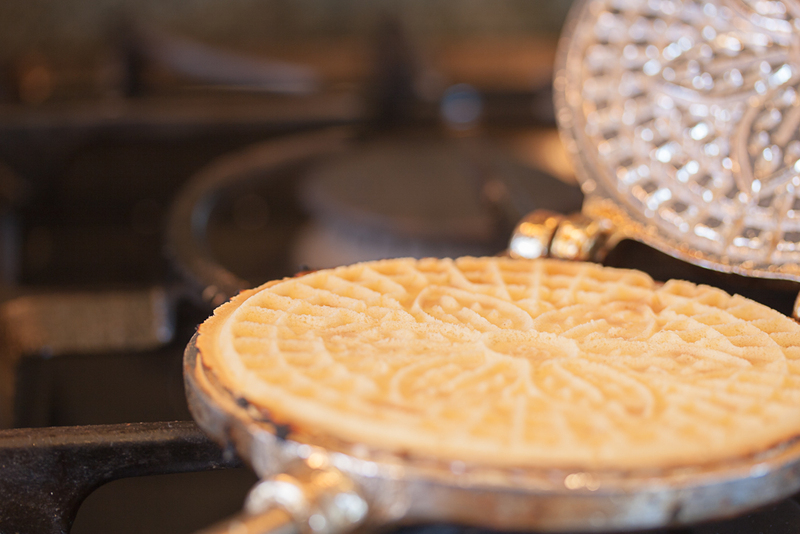 Transfer the baked pizzelle to a cooling rack and repeat the process until the batter is used up. We have been going to the Real Food Nation Café for years. 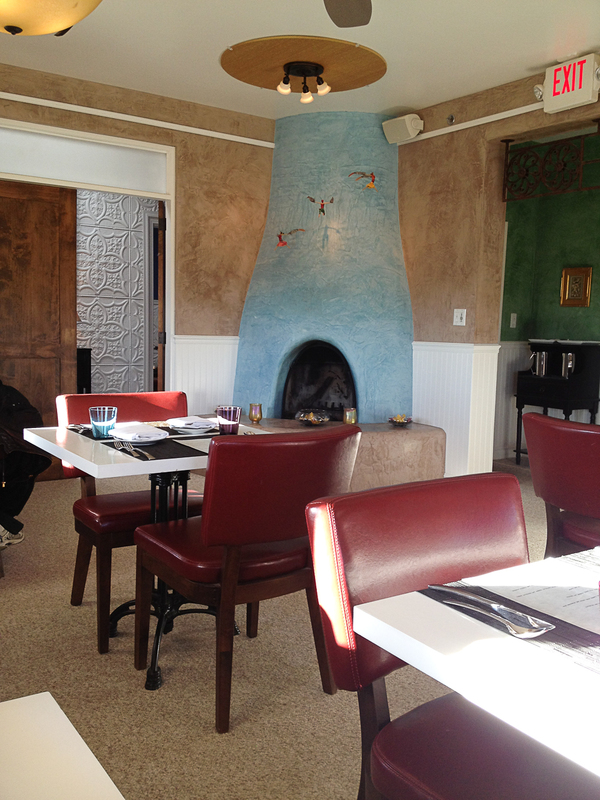 The casual atmosphere and the creative food have always hit the spot for lunch or Sunday brunch. 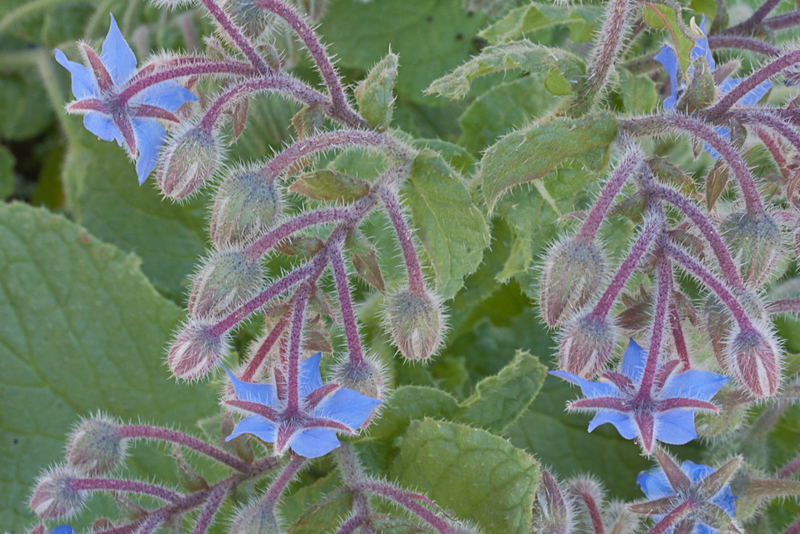 I have even been on a photo shoot in a workshop with Francesca Yorke, making images of the wonderful and beautiful herbs and vegetables they grow in their extensive on-site garden. 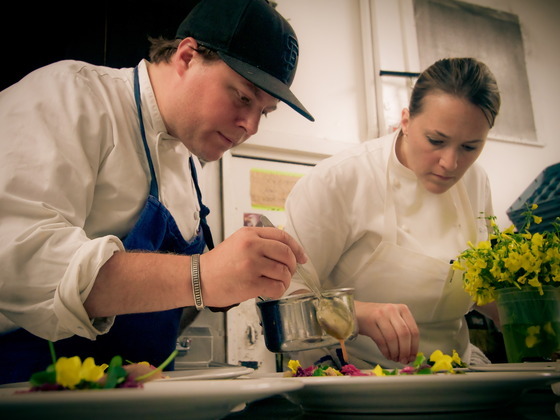 But even though we have talked about it many times, we have never made it to their culinary other-half, the Supper Club. Last night we were able to fill that gap in our Santa Fe experience, and it was well worth the effort. The dining room was pleasant, mostly two-tops with a couple of four-tops, comfortable leather chairs, and sunny windows with Roman shades if the sun gets in your eyes during Daylight Saving Time. The music would not be my choice – some Frank Sinatra and light jazz/pops – but it was not intrusive and certainly not so loud as to drown out your dinner companion’s conversation. The service was friendly and attentive. The wine list was small but well-chosen and well-priced with full-bottle, half-bottle, and by-the-glass selections. There was a good selection of beers, coffee and tea, soft drinks, and bottled waters as well. All of that put us at ease in anticipation of a good meal. The bread got a mixed vote from me. 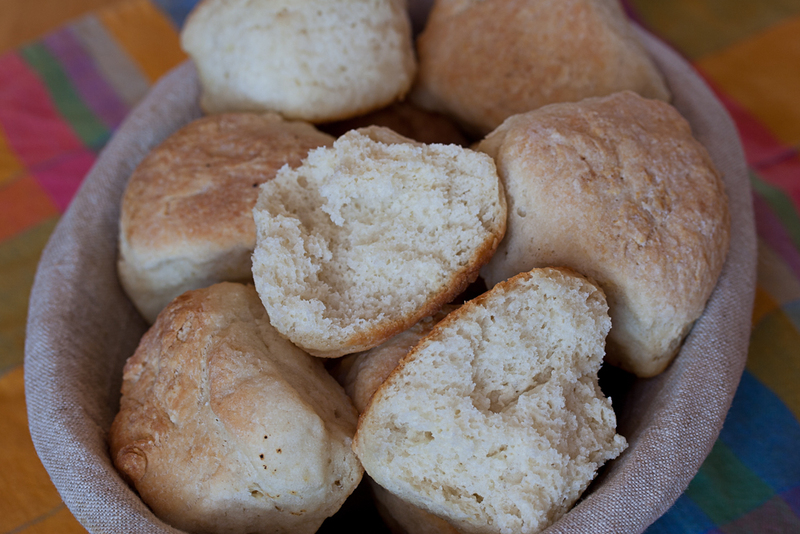 The little ciabatta rolls were crisp on the outside with a flaky crumb and extremely tasty. The sliced French bread was dense and ok, not great. But we didn’t come for the bread, anyway. 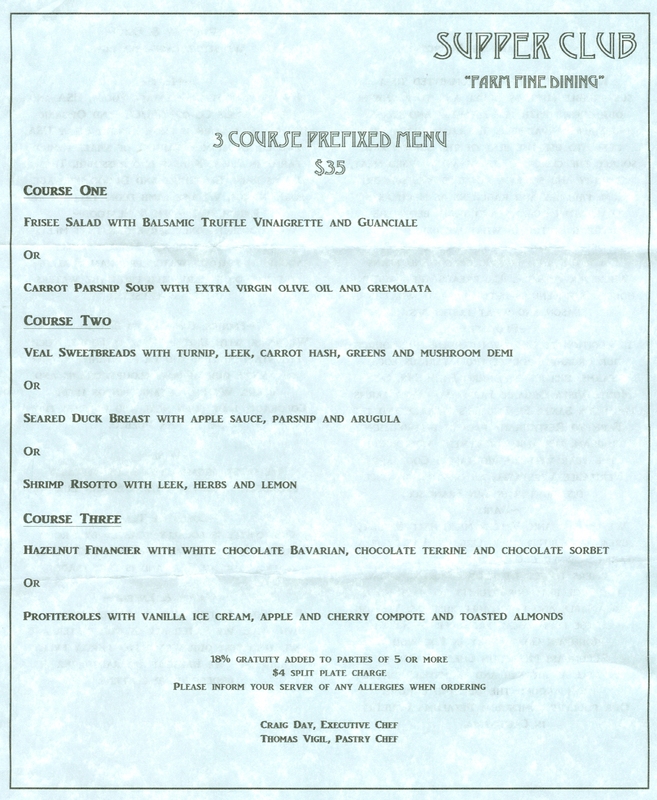 Right now the restaurant has a prix fixe menu, three courses for $35. 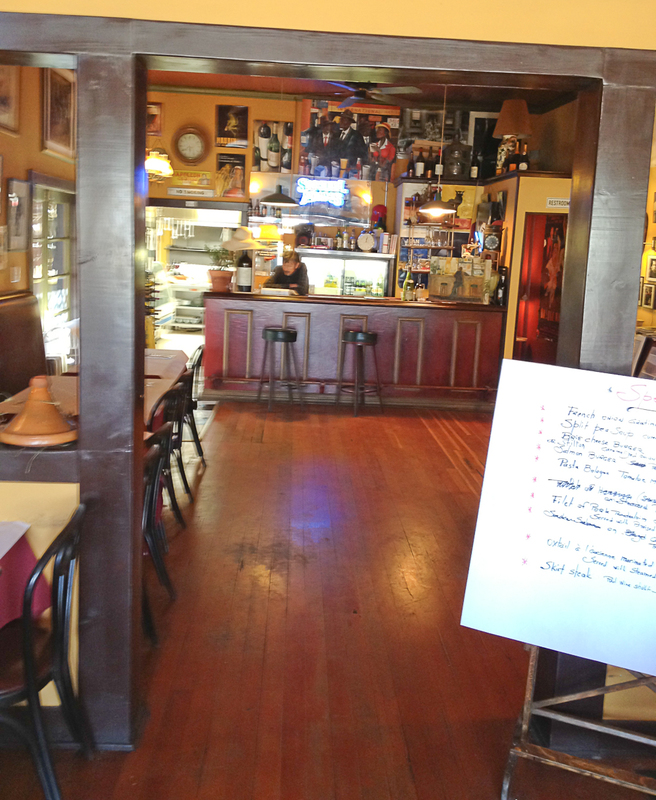 The menu changes frequently, so call ahead or check the web site. Last night there were two choices of appetizer, three choices of entrée, and two choices of dessert. Even at that, chosing was difficult because everything sounded delicious. 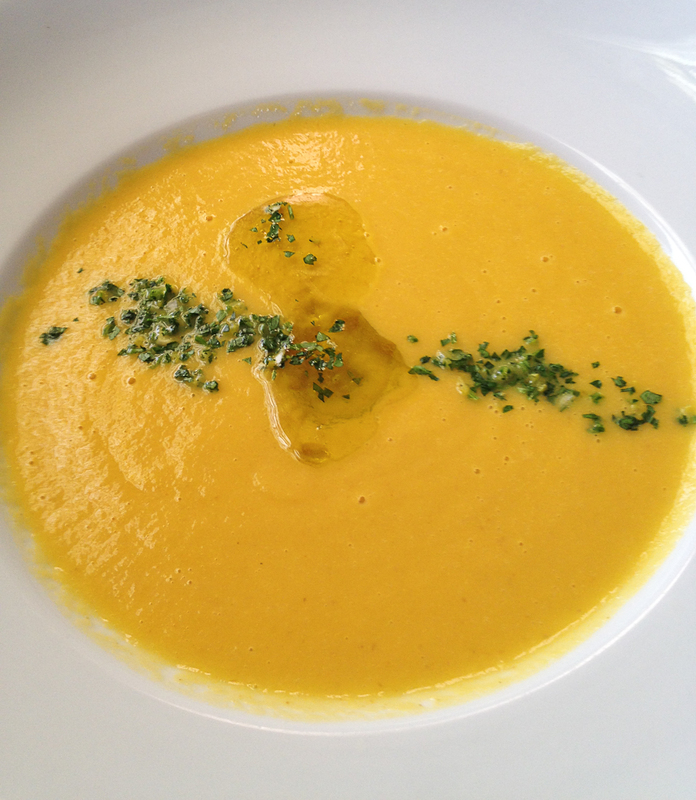 Susan chose the carrot parsnip soup. 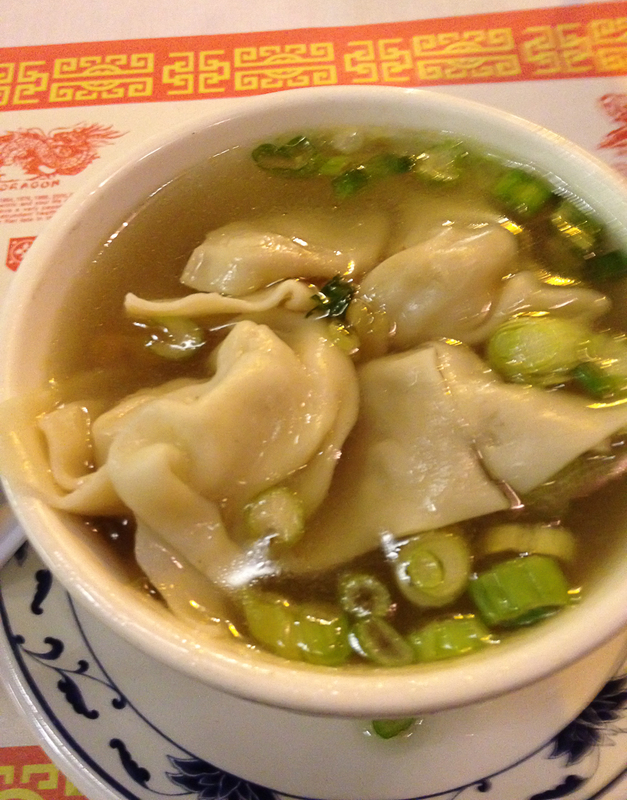 The golden bowl came to the table laced with a pool of green-hued extra virgin olive oil. 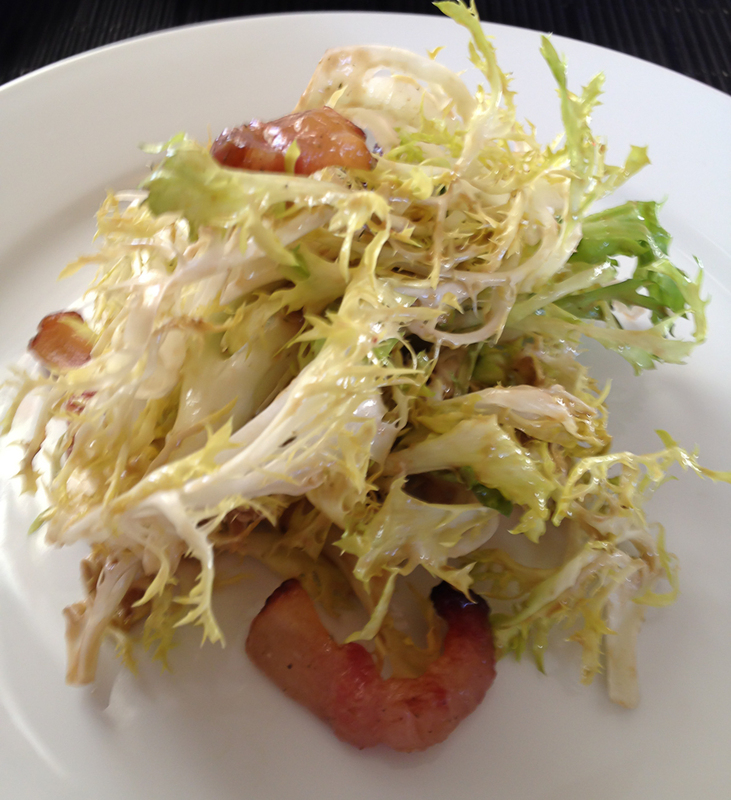 We both chose veal sweetbreads which, when well-prepared, is one of our favorite dishes and not commonly available. We were not disappointed. The sweetbreads were perfectly cooked and seasoned. 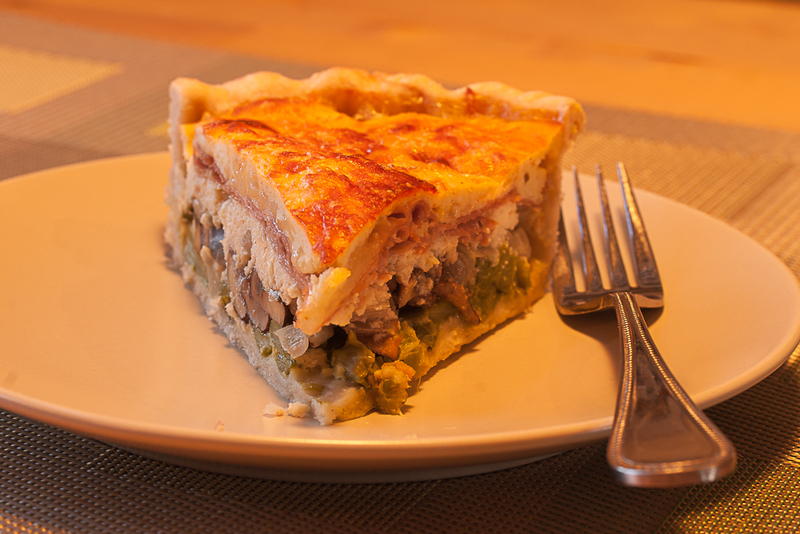 They were complemented by tender Swiss chard and a “hash” of turnips, leeks, and carrots. 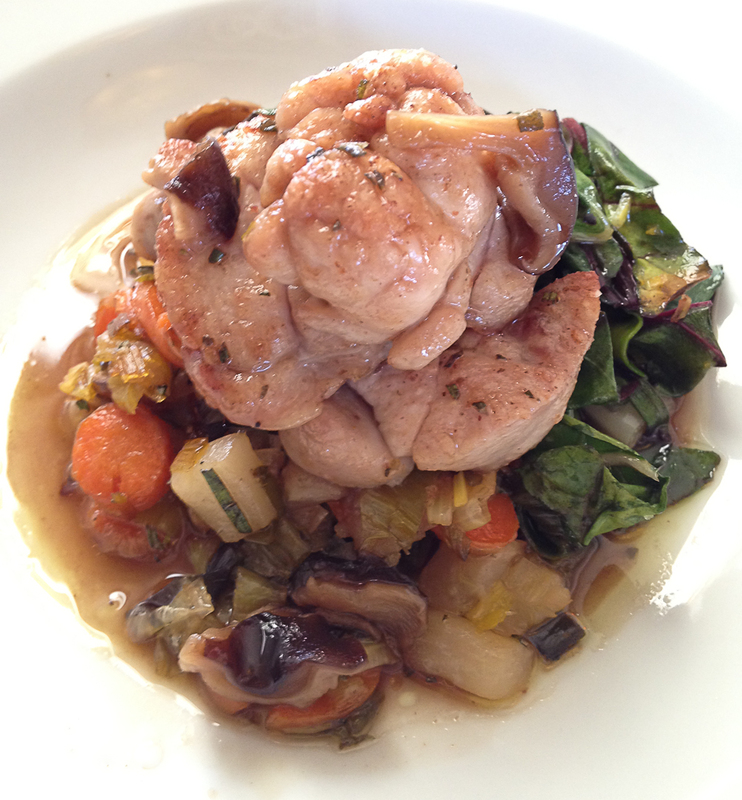 The sweetbreads were sauced with a fragrant, flavorful mushroom demi-glace. Both desserts were beautifully presented, and a fitting end to the evening. 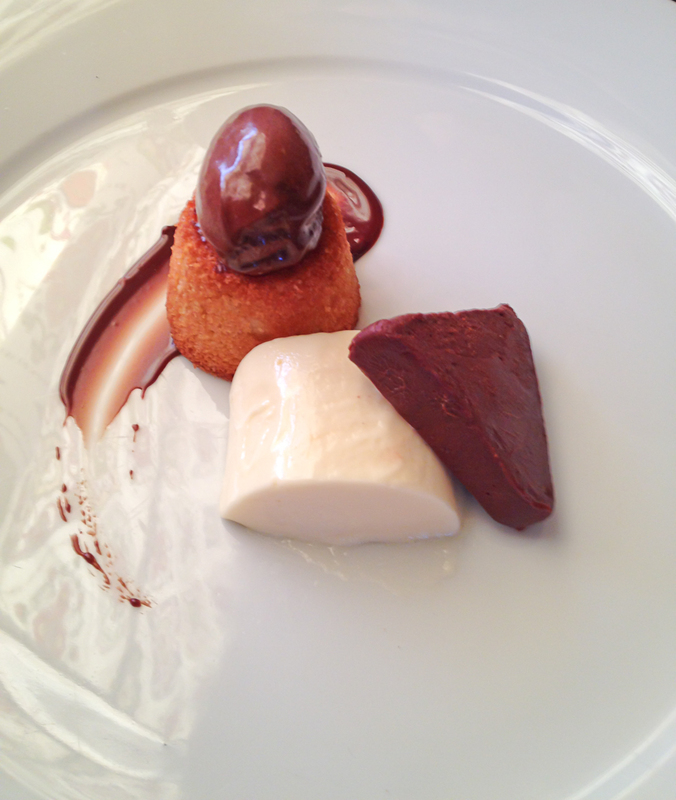 The hazelnut financier came with three different kinds of chocolate. 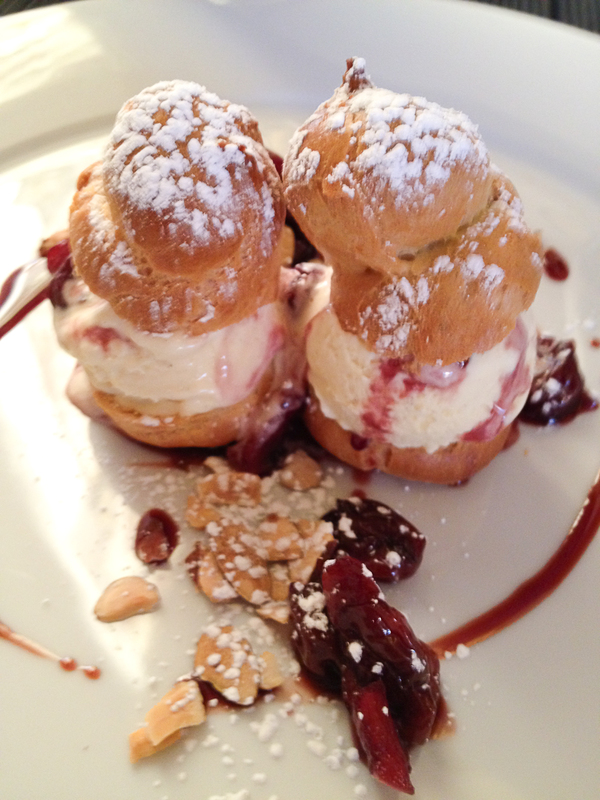 The profiteroles were classically done, and fortunately not too big as I could have eaten more than my diet allows. A few months ago I wrote about Carol’s favorite biscuit recipe, the Southern classic “Touch of Grace Biscuits”. This post is about sourdough biscuits. 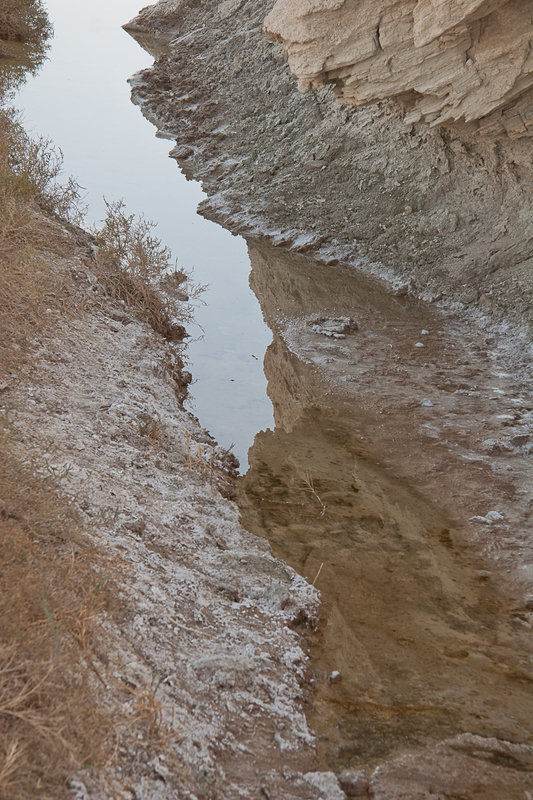 When we lived in West Texas, for several years I attended an annual all-male overnight fishing trip held by some rancher friends on the banks of one of the branches of the Brazos River running through a parcel of one of the legendary West Texas cattle ranches. Menus included classic ranch fare – grilled steaks, beans, fish (if we caught enough), hamburgers, barbecue of all sorts, and of course lots of beer. The highlight, though, was a chuck wagon breakfast. The cooks would arise before everyone else, stir up the fires that had been stoked for the night, and begin to cook huge slabs of sliced bacon and scrambled eggs in surplus Army ammunition cans set over the open fires. They also stirred up the dough for sourdough biscuits to be baked in old-fashioned spiders (three-legged Dutch ovens with flat lids) that would be buried in the coals of the campfires. This was a feast for a king, or at least some satisfied West Texas cowmen. 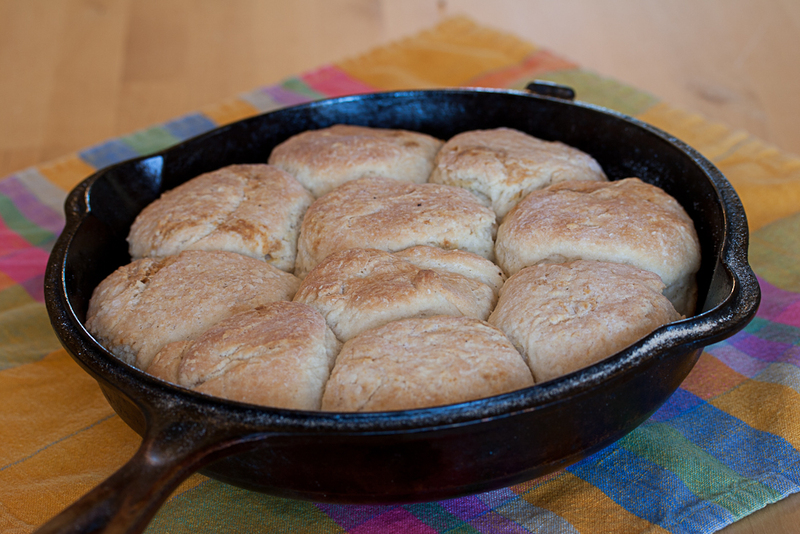 Sourdough biscuits need to be started the night before you serve them at a cowboy breakfast out on the range, so be sure to get things going before the libations and campfire stories move into full pace. Hopefully you will have a sourdough starter that you have been treasuring and “feeding” for a long time, but don’t despair if you don’t. You can start your own in a week or two before the cookout. Yeast is a fall back, but it is definitely not viewed with favor out on the ranch. Depending upon how many mouths there are to feed, you will need to increase the recipe. Allow for at least three apiece, because even modern cowboys are hungry. If you want to bake these at home, you don’t need to dig a fire pit, you can just use your oven. However, the instructions change a bit. The night before, dissolve the starter thoroughly in the milk. Be sure to use a large metal container that can be covered securely to keep out any varmints – human or otherwise – during the night. Thoroughly stir in one cup of flour, cover securely, and set in a warm place: not too close to the fire, but also not out in the cold night air. 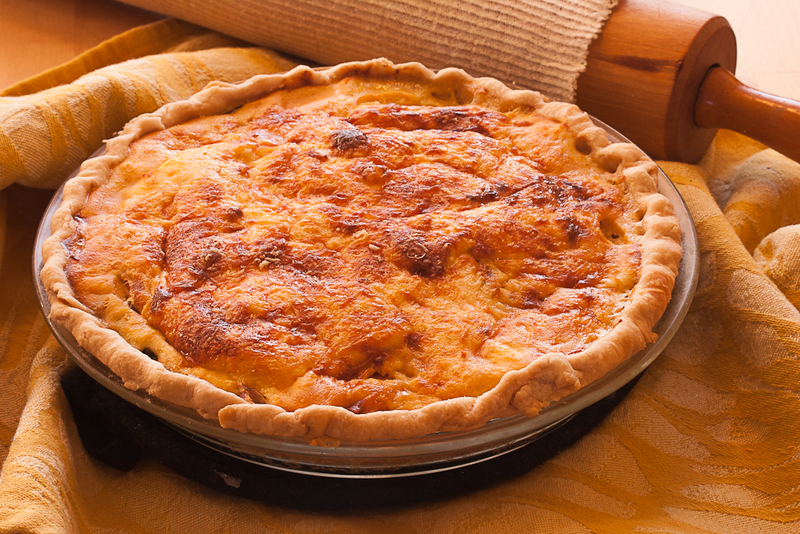 In the morning, combine the remaining 1½ cups of flour, salt, sugar, baking powder, and soda. Then add to the starter mixture from the night before, and using clean hands (!? ), combine into a soft dough. Knead in the metal container for a few minutes and let rest. In the meantime, prepare the fire: quench any active flames and with a hoe or shovel pull the coals to the edge of the fire pit so that your spider or Dutch oven will fit easily into the hole. 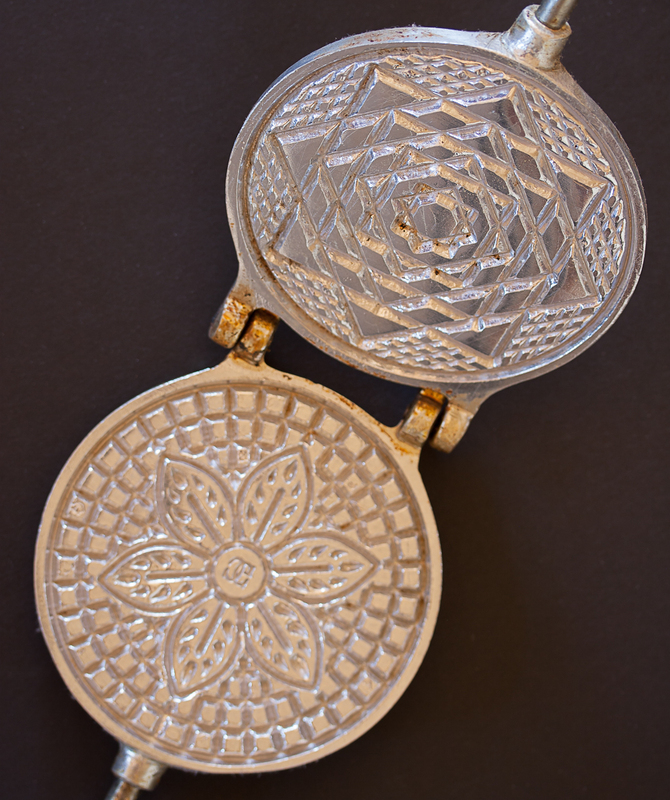 On a flat, lightly floured surface, pat the dough into a round about ½ inch thick. Then cut individual biscuits. If this is a high-class cookout use a 2½ inch biscuit cutter. Otherwise use your cleanest knife to cut 2 inch squares. 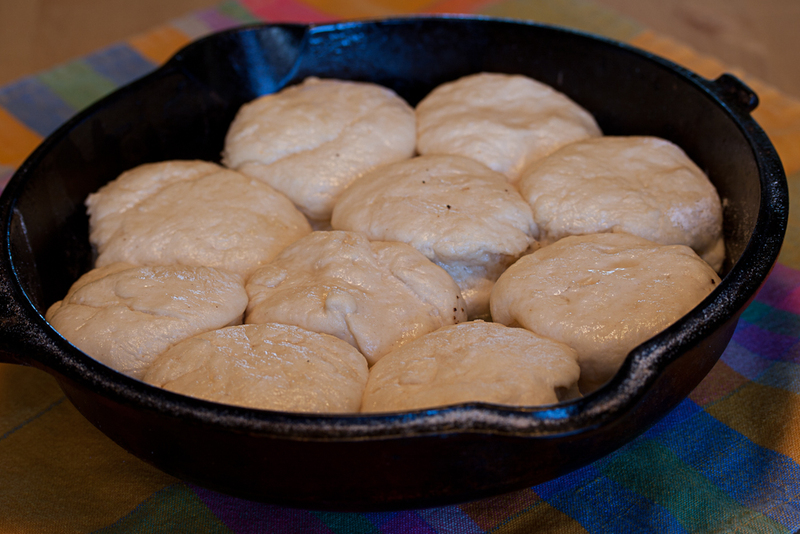 Dip each biscuit in bacon grease and place it in the bottom of the cast iron pot until the pot is completely full. Put the lid on the pot and lower the whole thing into the prepared cooking pit using the bale attached to the pot and a hook or hoe. 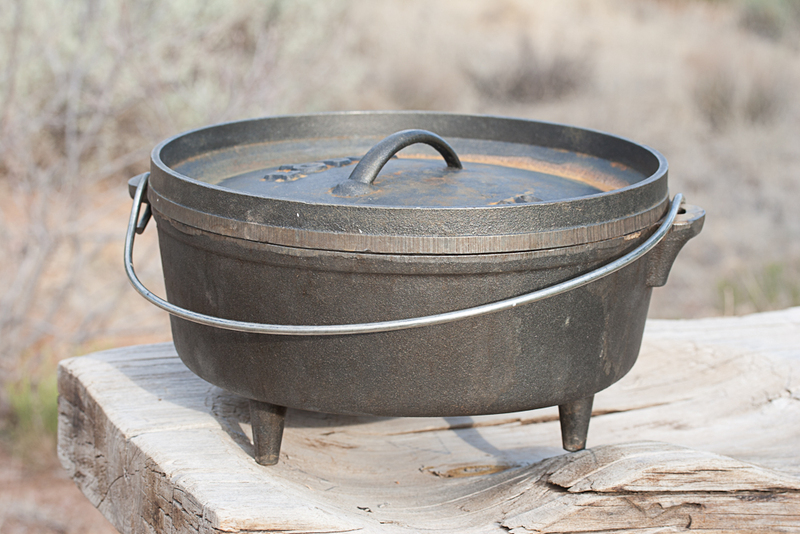 With the hoe or shovel, layer some of the coals on the top of the cast iron pot – enough to evenly cover the lid. Bake for about 30 to 35 minutes. 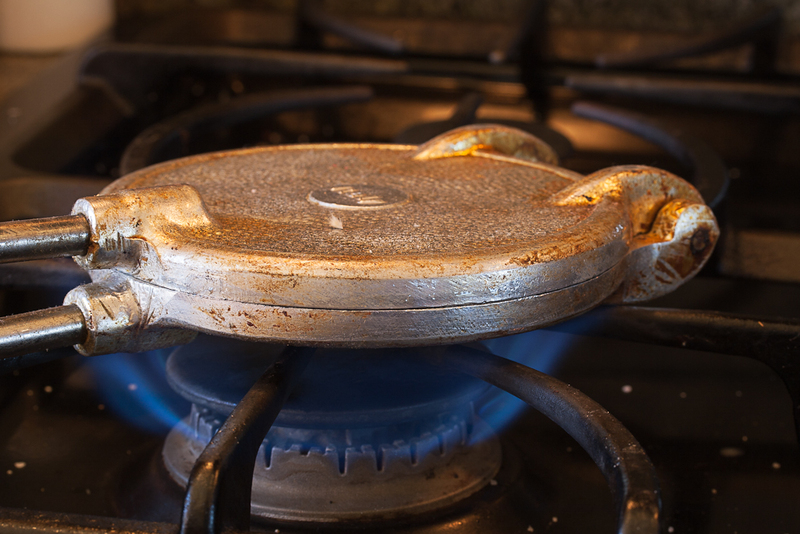 It is very hard to check the baking, but you can try to remove the coals from the lid to check. Just remember to put them back on top if you bake some more. It is more likely that you will just have to take pot luck (so to speak), but my observation is that the usual crowd is just happy to get something to eat. If you are baking at home, dip each biscuit in melted bacon grease or a combination of oil and melted butter (bacon grease may be too strong a flavor for a home meal). Arrange the biscuits in a 10 inch cast iron frying pan. 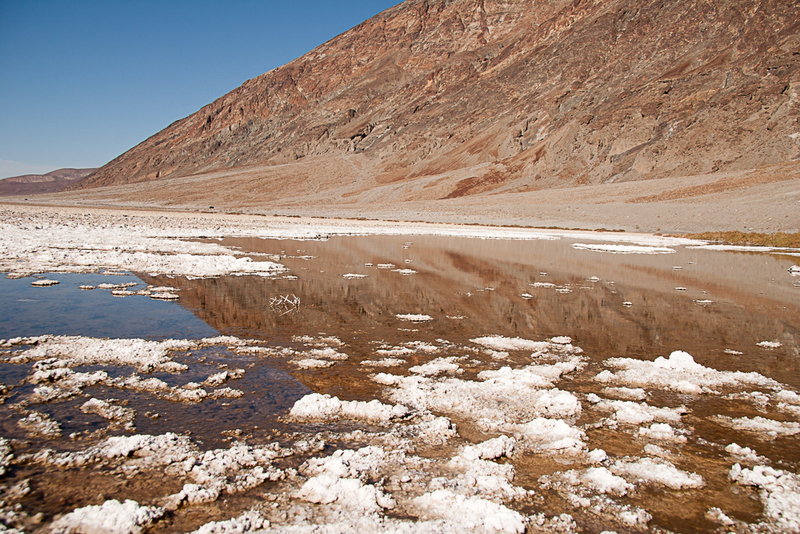 Bake in a preheated oven at 375° for 30 to 35 minutes. Serve immediately. Cold cowboy sourdough biscuits get as hard as a rock. 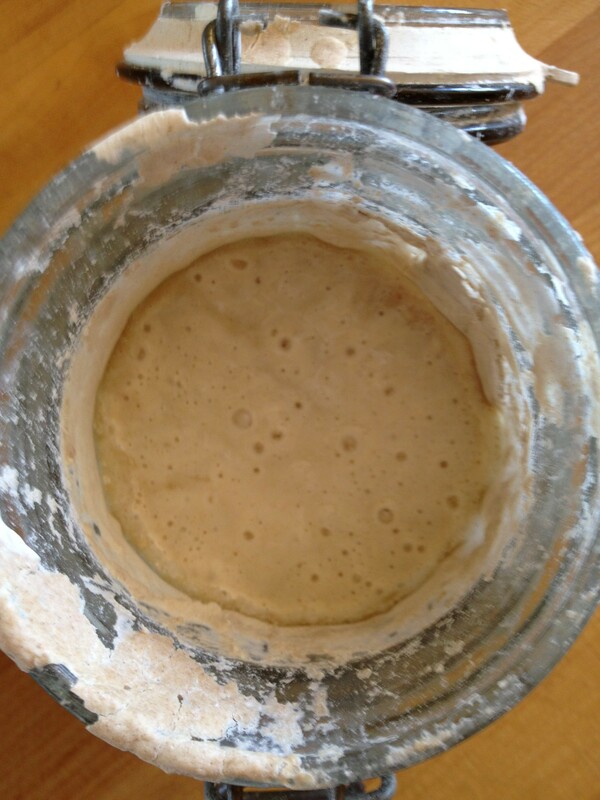 Sourdough starter can last a long time if it is properly cared for. We got one from a neighbor in Utah nearly forty years ago. That starter subsequently traveled to Texas, back to Utah, on to Louisiana, back to Texas again, and now New Mexico. Starter can be easily kept out-of-the-way in a closed jar in the back of the refrigerator for years. If you haven’t used it for several months it will have to be revived before using it. If you can’t revive it, never mind. It is easy enough to start a new one. But don’t expect your friends to help. Years ago we gave a starter to my brother and his wife. They enjoyed it for some time and even gave some to their friends. Calamity struck and their jar of starter got thrown out when an unknowing individual cleaned out the refrigerator. When my sister-in-law asked her friend for a new starter batch, the “friend” refused! It’s always better to be independent of others. 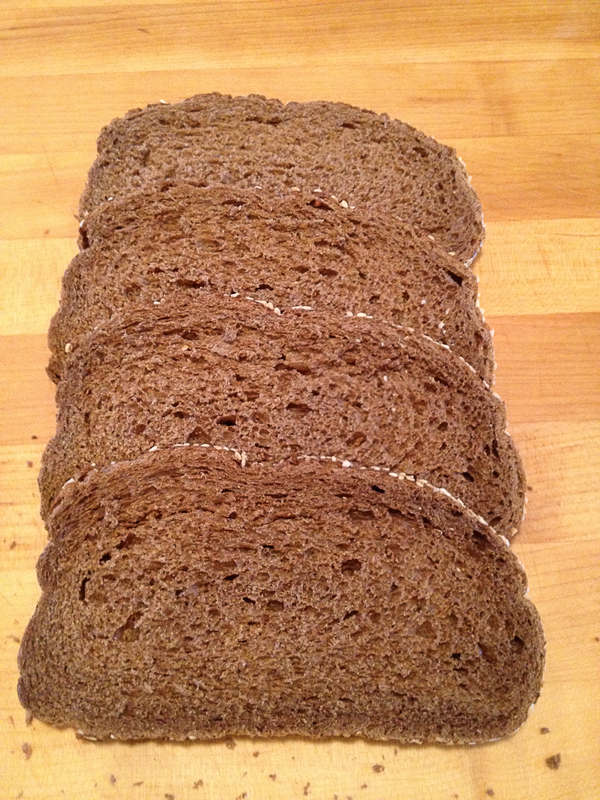 Sourdough is slower than commercial yeast so breads made with it often do not rise as much. For that reason, breads made with sourdough alone require a long rise or fermentation, but starter can still be used for flavoring. The most successful recipes are for biscuits, cornbread, pancakes, traditional country loaves, and French bread. Mix the milk and flour together in a large ceramic bowl until smooth. Set uncovered in a warm kitchen for 2 to 5 days, stirring occasionally. When the mixture is bubbly and has a yeasty, sour smell, the starter is ready. Store well covered in a glass or ceramic container on the counter or in the middle of the refrigerator. Keep at least 3 cups on hand. In a 4 cup or larger clear glass jar, mix the flour and water into a smooth paste. Set uncovered in a warm place. The kitchen is usually the best choice. Every day, check the mixture for bubbles, remove any tough skin that has formed on the top, pour off about half of the mixture, and add an additional ½ cup of flour and ½ cup of water, stirring to form a smooth paste. Repeat this process each day until the mixture is covered with bubbles and expands to double size or so. You should observe frequently during the day and evening because a good starter will eventually collapse from its own weight and lose volume. You will probably need to repeat the process for a week or more before you have established a good starter. After that, you should repeat the replenishment process for at least a couple of days before you plan to bake. 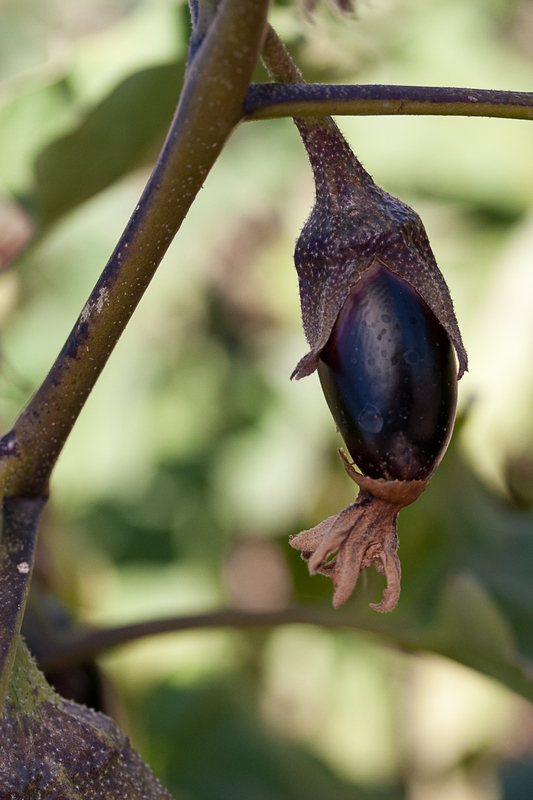 You may store the starter in the refrigerator, but that is not necessary and even encourages less desirable things to grow and discolor the mix. If that happens, pour off the discolored top part, keeping just a few tablespoons of the starter to rejuvenate your stock. Mix the flour, milk and sugar together into a smooth batter. Sprinkle the yeast over the surface and stir in. Allow to stand uncovered in a warm kitchen until the mixture is bubbly and with good aroma. The starter is ready. Store and replenish as above. If you have not used the starter for a long time, you may need to add milk and flour in equal amounts with a tablespoon of sugar, and let the mixture stand overnight before using. A while back I wrote about making sauerkraut. 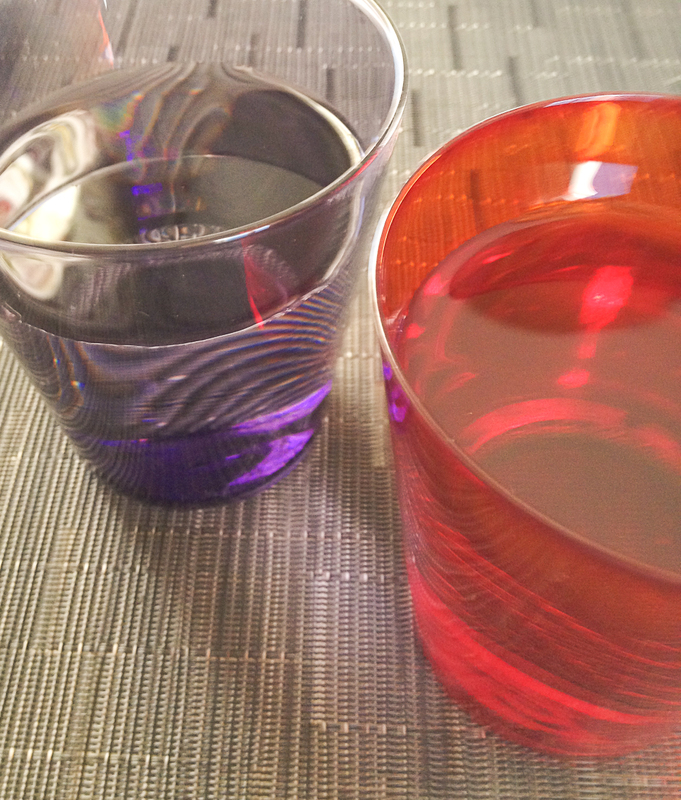 The recipe called for two heads of red cabbage. Even that small amount of cabbage makes a lot of sauerkraut, especially if you are eating other things during the long winter. Such surplus calls for creativity in what to do with all of the sour cabbage. One thing comes to mind immediately: make some Reuben sandwiches. These are a real delicatessen classic, and if you have ever been close to the Lower Eastside in Manhattan, guaranteed you have had a Reuben. Katz’s Delicatessen on East Houston is one of the most famous purveyors, but that is not where the sandwich got its start. 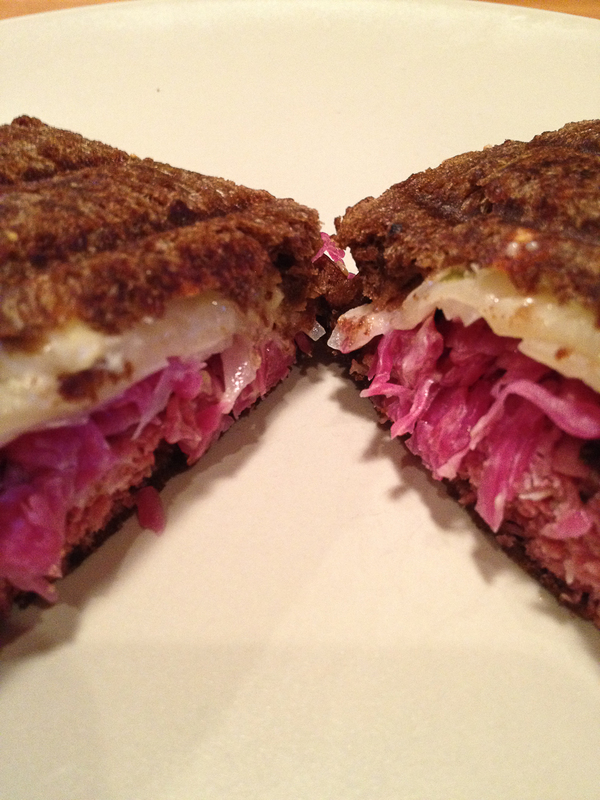 As a matter of fact, nobody is exactly certain as to the origins of the Reuben. 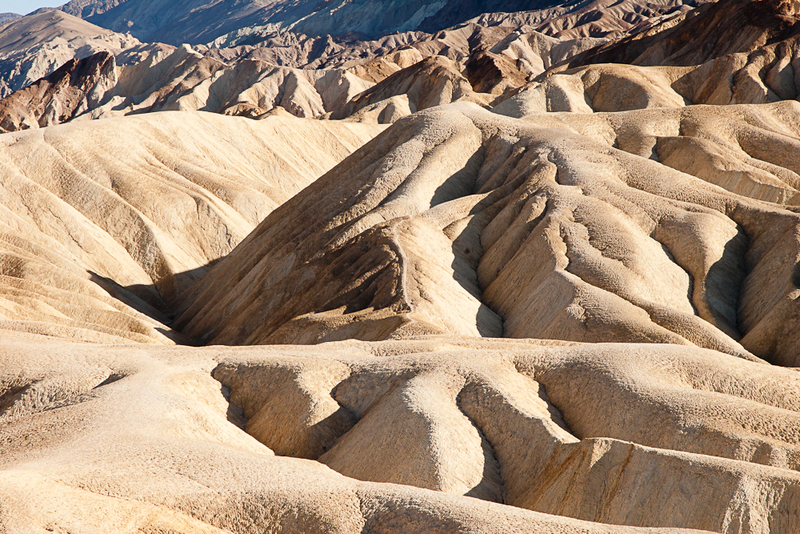 There are at least three stories about the creation of the sandwich. The Oxford Companion to American Food and Drink, edited by Andrew F. Smith and Arthur Schwartz’s New York City Food contain the most authoritative descriptions of the history and the controversy surrounding the sandwich. The most likely explanation seems tied to the famous New York delicatessen, Reuben’s Restaurant, on East Fifty-eighth Street. Arnold Reuben, the owner, reportedly created a huge sandwich for Annette Selo (variously described as making a Charlie Chaplin movie or as an out-of-work actress) who came in one day asking for something to eat. Reuben created a big sandwich which Annette suggested should be called an “Annette Special”. The reply came back something like, “Fat chance,” from Reuben, and the sandwich became so popular that it wound up on the menu as “Reuben’s Special”. It consisted of rye bread, Virginia ham, sliced roast turkey, Swiss cheese, cole slaw, and Russian dressing.. The second explanation is that the original was created in the 1920’s for some hungry poker players at the Blackstone Hotel in Omaha Nebraska, by Reuben Kolakofsky. 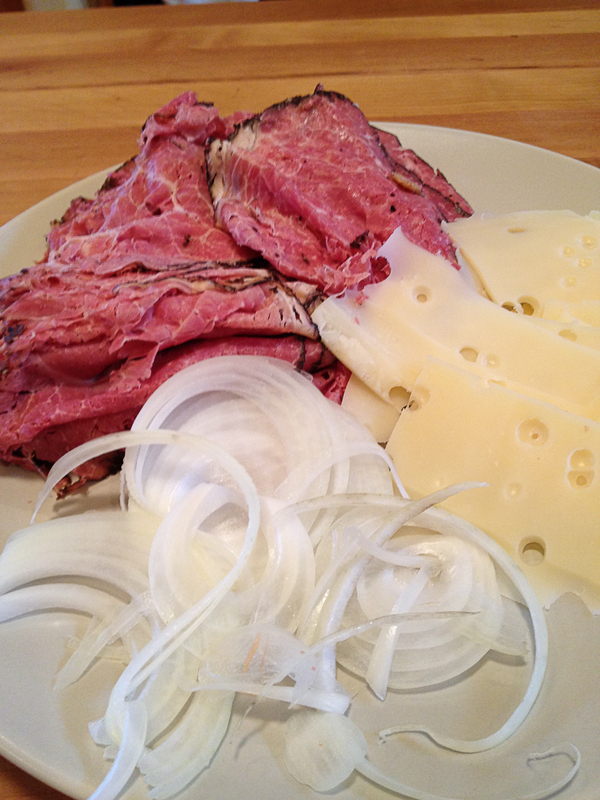 The sandwich included corned beef, Swiss cheese, sauerkraut, and Russian dressing. An employee of the hotel or maybe one of the poker players entered the recipe in a sandwich contest, winning the contest and ensuring the fame of the sandwich. 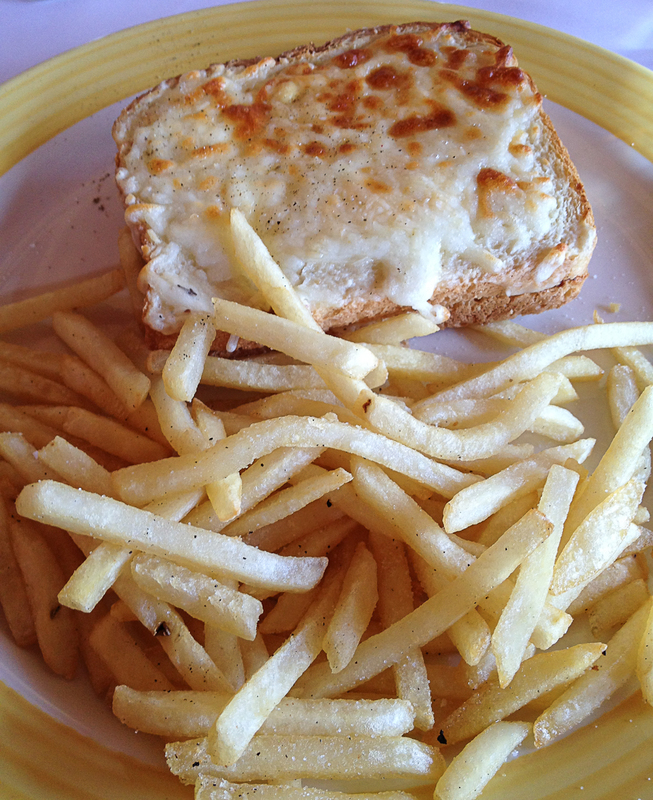 The third explanation is that the sandwich was created in 1937 at the Cornhusker Hotel in Lincoln, Nebraska. The hotel has reportedly produced a menu which includes the name of the sandwich and its ingredients along with the date, thus providing the only written documentation for the creation of the sandwich. 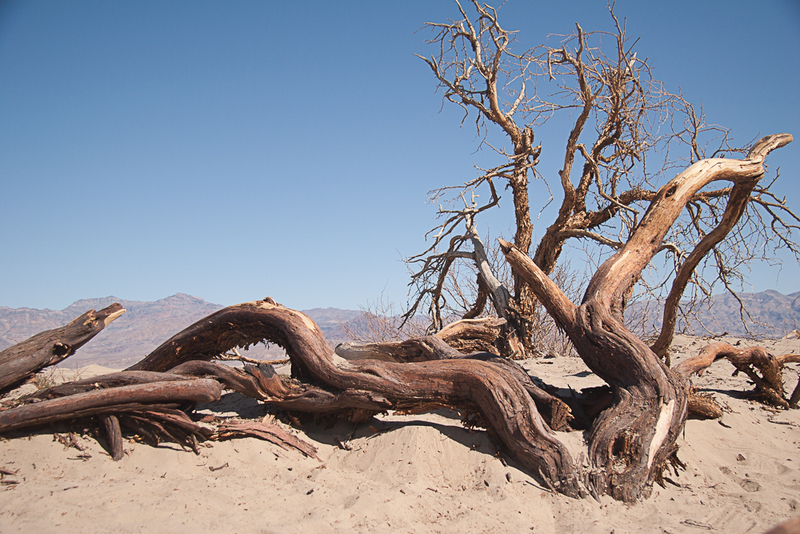 Over time, the stories have become interwoven and the dates have changed in various tellings of the stories. So, it seems likely that the real origin of the Reuben sandwich will never be known with reliability. Still, there is no doubt that the Reuben has become one of the all-time favorite American sandwiches. These days, the ingredients usually include rye bread, Russian dressing, Swiss cheese, sauerkraut, and thinly sliced corn beef. 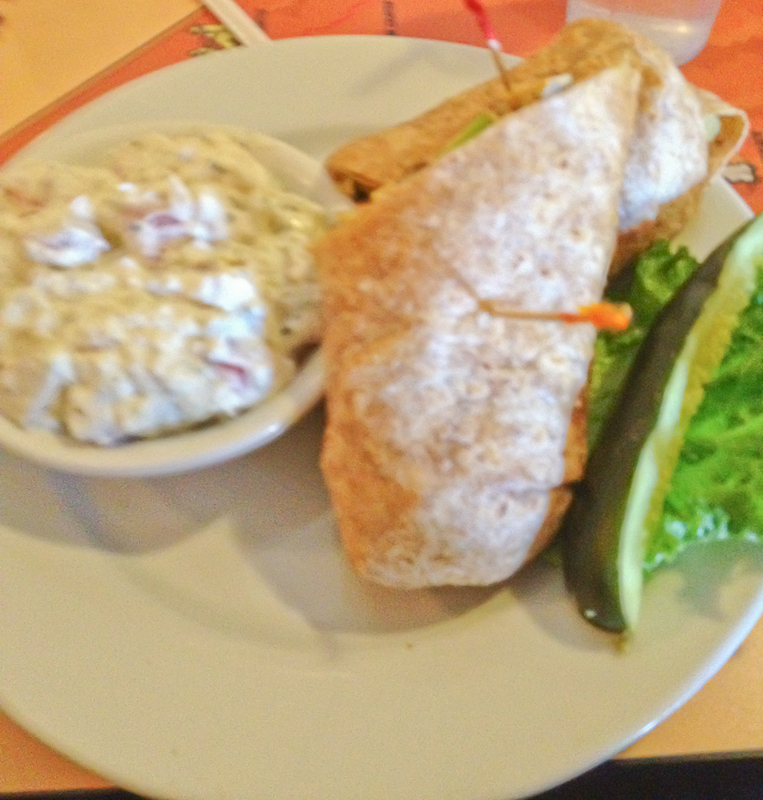 Pastrami and Thousand Island dressing are common substitutes. 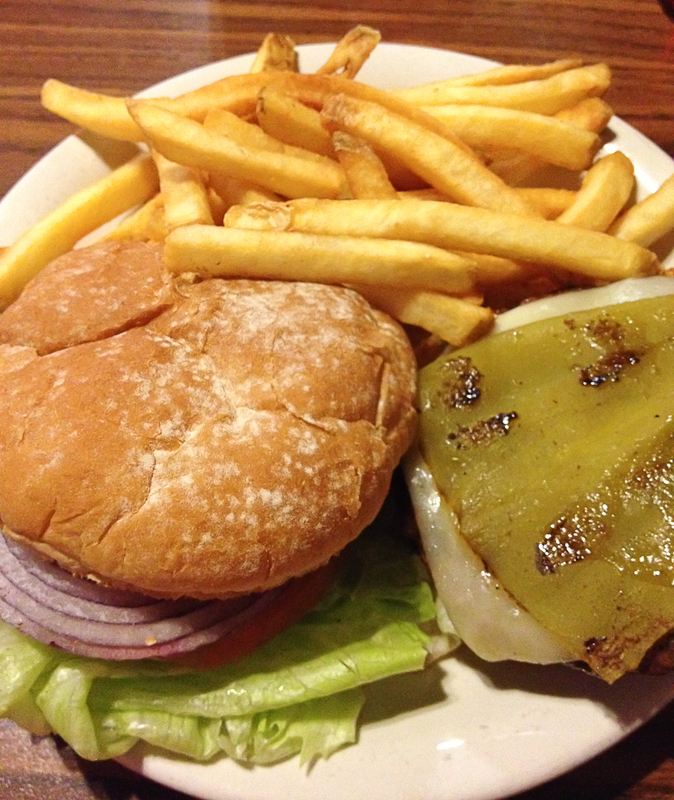 The sandwich is often grilled and best when it is hot. 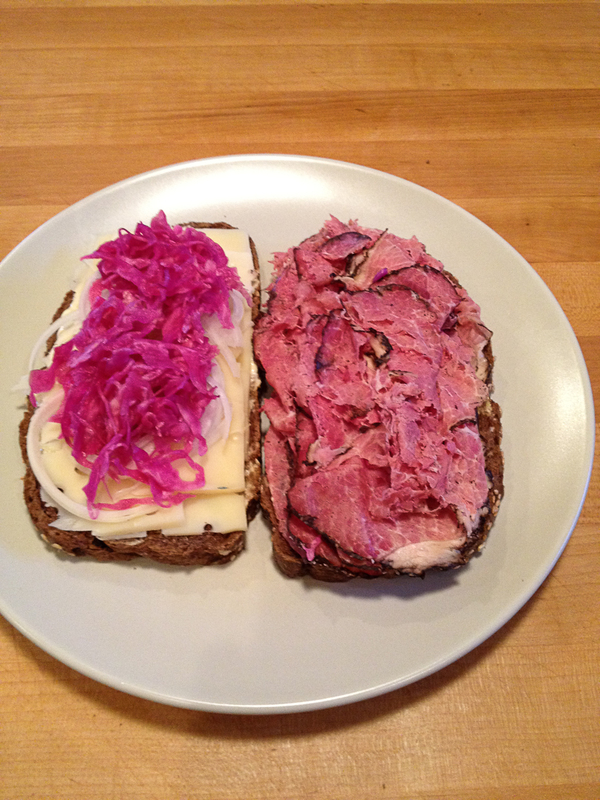 My version substitutes dark pumpernickel bread for the rye and pastrami for corned beef. Also, I am not a big fan of Russian dressing, so I have made my own sauce. The recipes that follow reflect those preferences. But the sine qua non to me is the sauerkraut, so this is a perfect place to use that kraut you made in your own crock. 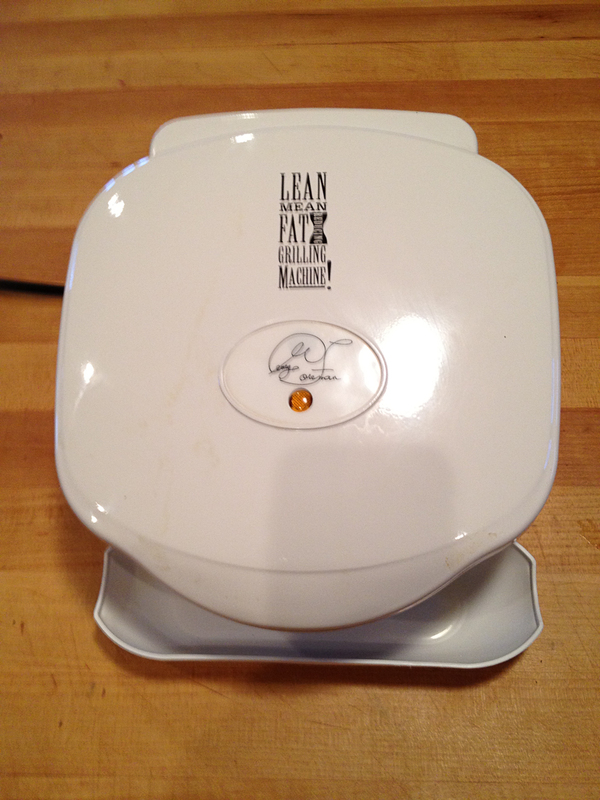 I used our George Forman grill to toast the sandwiches, but you can use a panini press or a skillet. This recipe makes two large sandwiches. Combine all the ingredients in a small bowl, mix, and set aside. Arrange three slices of Swiss cheese over a bed of sliced onion on each of the remaining two slices of bread and form two sandwiches. Brush the tops of both sandwiches with half of the melted butter and place the sandwiches, butter side down, in a skillet over medium heat. Press down occasionally with a spatula until the bottom is well-toasted. Alternatively, butter both sides and toast in a George Forman grill or a panini press. 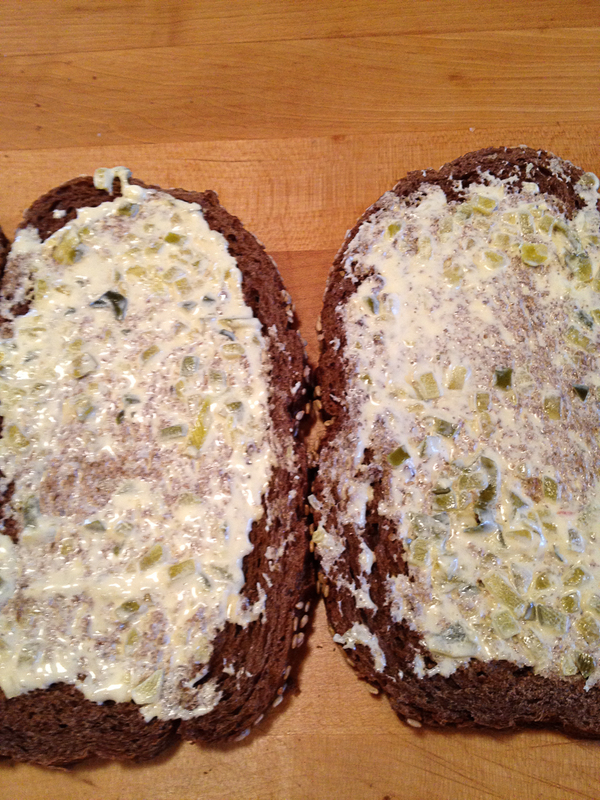 Brush tops of the sandwiches with the remaining butter, turn the sandwiches in the skillet, and continue toast until the sandwich is well-done on both sides. Serve immediately, preferably with a large whole dill pickle and potato chips or potato salad.